"Right to be forgotten" ruling threatens to "curb freedom of expression"
BBC economics editor Robert Peston warns that Google’s implementation of the controversial “right to be forgotten” ruling is working to “suppress legitimate journalism” after one of his articles about Merrill Lynch boss Stan O’Neal was scrubbed from the search engine. 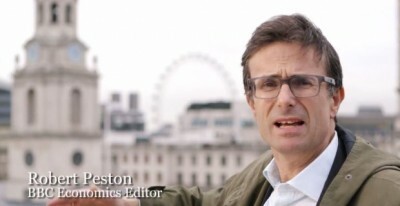 Peston complains about how Google notified the BBC that one of his 2007 articles about former Merrill Lynch boss Stan O’Neal’s role in the financial collapse had been deleted from search results for Google users in Europe. Peston later updated his piece to note that it could have been an individual in the comments section who flagged the article for deletion by Google, a prospect that threatens even more widespread ‘disappearing’ of news articles. Google has already received over 50,000 requests to remove articles from its European search results in the few days since the ruling was implemented and has hired “an army of para legals” to deal with the influx. Ball says that editorial decisions belong with publishers, not Google, and that news outlets need to fight back against what represents a challenge to press freedom. One such example was You Tube’s compliance with a request from the British government to censor footage of the British Constitution Group’s Lawful Rebellion protest, during which they attempted to conduct a civil arrest of Judge Michael Peake at Birkenhead county court. Government orders to remove content from Google have spiked over the last 18 months, with requests surging by 26% in the final months of 2012.